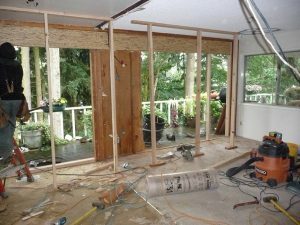 All exterior doors should swing into the structure to allow for proper weatherproofing and safety. Entry doors are normally 13⁄4” thick, 6’8” high and 3’0” wide. Most codes require at least one 3’0” exterior door in each residential structure. When a remodeling plan calls for replacing an exterior door, the existing unit must be checked for width, height, and thickness. If the door is shorter than 6’8”, a standard door can be purchased and modified. If the door is taller than either of the industry standards (6’8” or 7’0”), modifications must be made or a custom door ordered. Should you wish to change the door thickness, the jambs and casings will normally need to be removed and new jambs installed. This is necessary because most exterior doors have rabbited jamb stops, which preclude easy removal and replacement. However, this is not the case on interior doors. In most cases, these doors feature applied stops that can be easily removed. Whenever a double door is considered, one panel will be classified as “inactive.” It will be stationary, held in place by two flush bolts installed at the top and bottom of an attached wood astragal, or in the center of an aluminum astragal. The active door will close against the stop placed on the astragal. The astragal serves two functions. One, it conceals the gap between the doors. Two, it provides a security system by holding one door firmly in place. Without this system, a firm push would force the two doors apart and permit unauthorized entry. Normally, double doors are available in 2’6″, 2’8″, and 3’0″. Interior doors are available in many different styles and materials. Hollow core—Paint or stain-grade. The paint-grade unit will normally be hardboard, metal or masonite with a cardboard honeycomb interior. A wood frame will enclose the core. When ordering, specify what type of finish you require. Unless custom millwork is ordered, regardless of what the door material is, the jambs and casing will be pine. Solid core—Paint or stain-grade. This type of door will have a particleboard core with 1⁄8″ skins front and back. The better quality door will also have a stile-and-rail wood frame surrounding the core material. Vinyl clad doors—Normally used in budget oriented commercial projects for interior passage doors. They’re also available for closet slider doors. The advantage of the closet doors is found in the vinyl-faced particleboard’s resistance to warpage and its lightness. They are available in 8′ 0″ heights. The surface can also be wallpapered. Steel and metal doors—A steel door can’t be used for a simple door replacement situation. The hinge placement is predetermined and the opening must be perfectly square and level. New jambs are always required. These doors are usually purchased pre-hung. Metal sliding and bifold doors are quite common in closet installations. They can be 8’0″ high, and are pre-finished, thereby requiring minimal maintenance. Pocket doors—The pocket and door are ordered separately. The better pockets will have the hangers mounted on the door edge, rather than on the top. This allows the door to be removed without removing the stops. The pocket will be as wide as the door. No electrical, plumbing, air conditioning, or wall intersection can take place within the wall space required for the pocket. Sliders—Manufacturers designate the opening door or window with an “X” and the stationary panel with a “O”. Thus, an “O-X-O” door will feature two fixed panels and one centered door. Accordion and bifold—Allow clearance for stacking width when the doors are open. Always compare rough opening requirements with available space to ensure proper installation. Swing doors—The door swing is dependent on the design and obstacles within the room. When ordering a door, specify where you are standing to clarify which side is left or right.